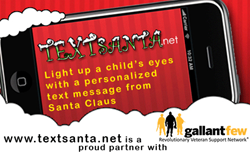 This year TextSanta will donate $1 from each order to the GallantFew. It means a lot that we are able to help our military personnel go from active duty to civilian life and to ease the transition for both them and their families. We are just happy that these children have their parents home for the holidays. TextSanta.net is a SMS text messaging service that sends text messages from Santa to children everywhere. The service helps provide the magic of Christmas and promotes good behavior in children. Every year TextSanta chooses a deserving charity to help support through the holiday season. This year the GallantFew will receive $1 for every order received from TextSanta.net. The GallantFew is a non-profit 501c(3) that helps veterans transition back into civilian life. It provides veterans and their families with the support they need after their deployment. As many can imagine our military have very demanding and dangerous jobs. Transition back to civilian life can be difficult and stressful for many, especially when trying to find a civilian job. The GallantFew offers support for the men and women who have served our country and who are struggling with Posttraumatic Stress Disorder (PTSD) or assistance finding a job. "It means a lot that we are able to help our military personnel go from active duty to civilian life and to ease the transition for both them and their families. We are just happy that these children have their parents home for the holidays." says William the Head Elf in Charge. If text messages from Santa aren't cool enough, parents also have the ability to order their children a Santa selfie by uploading an image of their Christmas Tree or mantle to picsanta.net and the elves will do the rest! Help support the GallantFew while bringing a smile to a child's face with TextSanta.net. Parents can purchase a quick text for $4.79 or a Text Santa Gold Package for $6.59. The quick and easy process will have messages scheduled within minutes! Started in 2008, TextSanta has delivered thousands of text messages to deserving children everywhere. To schedule a text message or order a Santa selfie visit http://www.textsanta.net today.